For most people, it would make their skin crawl. But not Scottish ex-pat Ian Maclean, who gets four Burmese pythons to wriggle over his body as part of a bizarre - and brave - treatment. Mr Maclean, originally from Helensburgh, in Argyll and Bute, uses the slithery reptiles at a zoo to 'cure' an old arm injury in the Philippines. It is a new massage craze that's sweeping Asia which, he insists, has nothing 'snake-oil' about it. The grandfather said: 'A friend told me it would be great for my persistent arm injury, and it de-stresses you. 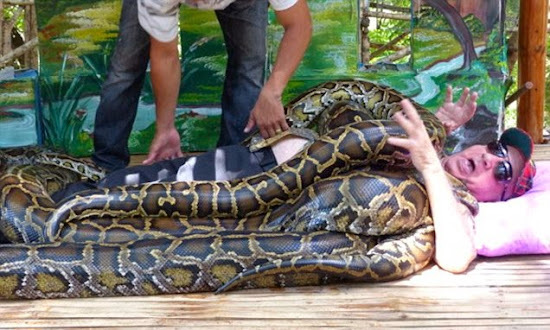 'Four Burmese pythons were my masseurs and masseuses. The slithering motion is actually really pleasant. The flickering of the tongue on the skin was a little uncomfortable. 'When all four snakes were placed on top of me they weighed around 250 kilos so it was impossible to get up. 'It's not for the faint-hearted. Once all the snakes are on top of you.you can't get up without the handler's help. So don't panic! Snake massage has become widely practised in Indonesia and Thailand and has spread as far as Long Island and Williamsburg, Brooklyn, in the New York. It is claimed the movement of the snakes creates an adrenaline rush fuelled by fear which has a positive effect on the customer's metabolism.